After formatting and partitioning our storage, we're ready to enter Slack/390's setup program. Again, experienced Slackware users will recognize this screen from previous installations. 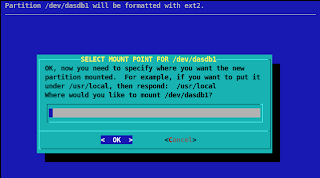 The arrow keys did not work for me via telnet, but you can use the '+', '-' and 'tab' keys to navigate the menu. You can read the Help section if you like now. 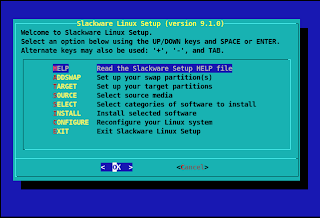 It is the original version for Slackware, not adapted for Slack/390, so some details are inaccurate. But most generic info is true for all installations, so if you are not in too much of a hurry, take a look. 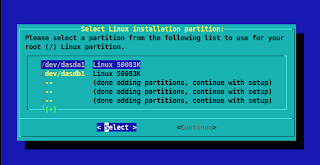 We'll skill setting up a swap partition, as we did not create one. First we have to inform the installer where we want to install Slack/390. 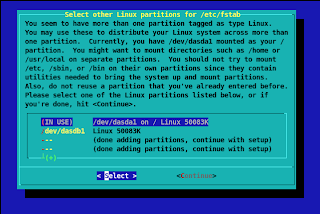 Select the first available partition (/dev/dasda1) as the target for our root partition. Here we decide which file system to use. 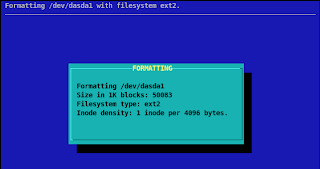 Again, we're using a virtual device that's on a real drive of our host system. Using a journaling file system here would cause double journaling. Unless you pretend to save precious data on your mainframe, I suggest using ext2 on your virtual storage to gain some performance. 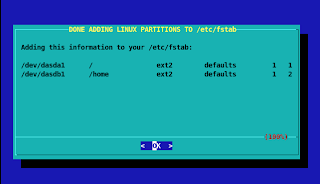 As mentioned before, I created a second partition for our '/home' directory, so select the free '/dev/dasdb1' partition now. 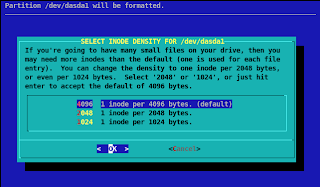 Again, select the quick 'FORMAT', the 'ext2' file system and the '4096' inode size. Enter '/home' here and press Enter. This ends the selection of our target. Next post: Selecting the source media!